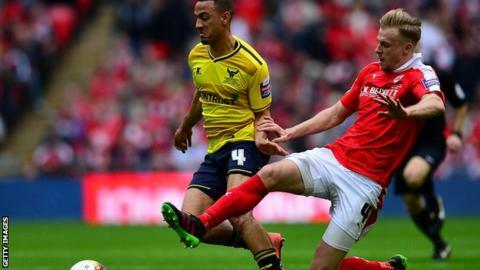 Oxford United manager Michael Appleton says securing promotion to League One will make it easier to hang on to their star players, such as Kemar Roofe. A number of clubs, including Nottingham Forest and Sunderland, have been linked with 23-year-old Roofe, who has netted 25 times in all competitions this term. Oxford sit second in League Two with five games remaining. "Every player wants to play as high as they can and Kemar's no different," Appleton told BBC Radio Oxford. Roofe made a permanent switch to the Kassam Stadium in the summer from West Brom following a loan spell last season. "He obviously sees it as he made a drop down from a Premier League club," said Appleton. "But sometimes you have to make those calculated decisions. "You have to take the risk to get the reward that comes with that. He's backed himself as a player and hopefully he'll back himself next season with Oxford United." Roofe's performances for the Yellows have seen him nominated for League Two player of the season alongside Northampton's Ricky Holmes and Bristol Rovers' Matty Taylor. "Certainly the goals he's scored have brought him to the attention of a lot of people and we're aware of that," added Appleton. "He's the type of player who's very consistent for us, got us a lot of goals and played in a variety of positions."